The Rev. J. 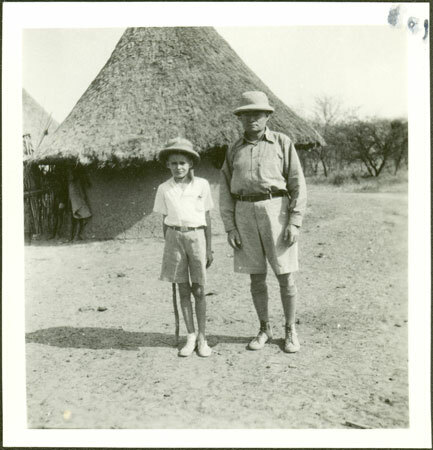 A. Heasty of the American Presbytarian Mission with his son, who was posted to the newly established Doleib Hill mission station on the Sobat River (roughly six miles from its confluence with the White Nile) in 1925 as a specialist in the teaching of English language. The station was founded in 1902 to provide industrial and agricultural training, a focus encouraged by the British administration. With an increasing demand for English language education from local elites however, the APM responded with another station at Nasir on the Sobat river. Note on print reverse ms pencil - "9 103 Heasty"
Morton, Chris. "Shilluk missionary and son" Southern Sudan Project (in development). 03 Jan. 2006. Pitt Rivers Museum. <http://southernsudan.prm.ox.ac.uk/details/1998.348.4.2/>.